Barres & Belles -- A Ballet Barre workout plus Kettlebell training suitable for the Pilates beginner or seasoned exerciser. 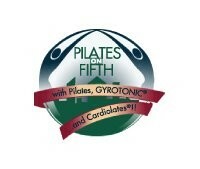 Pilates on Fifth’s signature “Barres and Belles” class utilizes kettlebells and ballet barre-based exercises to provide a challenging total body workout full of power and grace! “Barres and Belles” to give women the strength, flexibility and statuesque posture they need to feel great and turn heads everywhere they go. Kettlebell workouts have been proven to burn calories fast (kettlebell review) while ballet based workouts both burn calories and sculpt beautiful dancers’ bodies! With this powerful workout, you can experience the best of both worlds! There are no upcoming “Barres & Belles” classes on this day. Good class, Caitlin was a good instructor. Not the hardest barre class but definitely works you. The actual space is wild to walk into though, like it was frozen in time from the 80s. The interior design has clearly not changed, but it made me feel like it was the kind of place Nora Ephron would’ve worked out in. Really it’s fine that it didn’t look updated, but I wish they had had newer equipment for the class. All the mats were old and stretched out when I tried to plank, the balls not blown up enough, etc. Great instructor and awesome workout! I loved the use of kettle bells. Great workout. Hits every muscle. Mayo has great energy but I still prefer Caitlin. Caitlin is much better at giving instructions and showing the exact moves. Loved the class! Only negative was the size of the space was a little cramped but overall I really enjoyed it! This class is upbeat, fun, and challenging! You will definitely see results after a few classes. Kelly was awesome - so kind &amp; adapted the class as needed while serving up a serious workout! It’s low-impact, but be prepared to feel the burn!